In the last eight years, data traffic on our wireless network has increased a staggering 100,000 percent, driven primarily by video. We’re asking a network model designed years ago for modest and predictable increases in voice traffic to adapt to a world of streaming videos, high-definition games, and photo-intensive social media. We’ve been able to keep up with the increase by using more and more sophisticated, complex routers, switches and other gear, but this just isn’t feasible for much longer. It’s too slow, too inefficient and too expensive. At AT&T, we have found a better way. Our next-generation network is powered by technologies including software-defined networking (SDN) and network function virtualization (NFV). By 2020, we plan to virtualize and control over 75 percent of our network using this new software-defined architecture to meet the growing demands of data and video-hungry users. In short, we are becoming a software company – the new software-centric model is driving a cultural shift that is transforming all aspects of operations, recruitment, retention and training, within a company that is 140 years old. 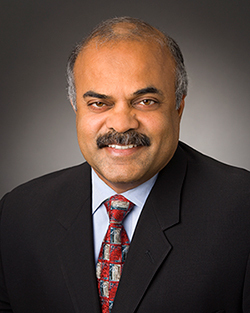 As President of AT&T Labs and Chief Technology Officer for AT&T, Krish Prabhu oversees the company’s global technology direction which includes network architecture and evolution as well as network, service and product design. He is also responsible for the intellectual property organization and Global Supply Chain. Krish has extensive background in technology innovation from his time at AT&T Bell Laboratories, Rockwell, Alcatel and Tellabs. He has previously served as COO of Alcatel, CEO of Tellabs, and CEO of Tekelec. He also previously served as a partner at Morgenthaler Ventures, where he assisted in developing information technology and communications start-ups. Krish earned a B.S. in physics from Bangalore University, an M.S. in physics from the Indian Institute ofTechnology, Bombay and an M.S. and Ph.D. in electrical engineering from the University of Pittsburgh. Hosted by Professor Debasis Mitra.